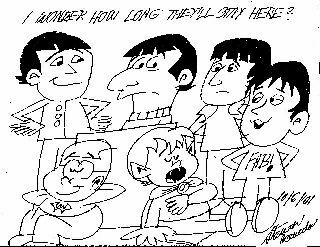 My Buddy Steve created this cartoon drawing of The Beatles with our alter egos Steven W. Warlock (Him) and Frankiestein (Me) hanging out with them as groupies. I had asked him to draw a scene with us with bags of luggage but he forgot to put them in. There is however a huge box they are sleeping besides. Steve created his alter ego in homage to two popular 60's fantasy based sitcoms, Bewitched and I Dream Of Jeannie. 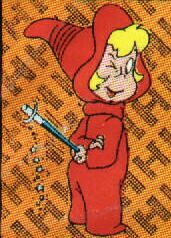 The other major influence were his favorite comic book/cartoon characters Wendy The Good Little Witch from Harvey Comics and Woody Woodpecker created by Walter Lantz. He combined elements from the tv and cartoon characters into a protagonist that takes no garbage from anyone. Usually he's a nice guy minding his own business not really bothering anyone. But when someone gives him a hard time Steven W. Warlock gives them the business tenfold. Even though he is set in his ways as a mystical being. He's known to stick up for the little guy on occasion. He might be a spitfire but he has many loyal friends in the mortal world and the other side. Frankiestein, my alter ego is not your ordinary vampire. For one thing he is a half breed. Both mortal and vampire. Because he is a combination of both sides of man and monster he doesn't have to sleep in the daytime like other vampires. He is strictly a vegetarian at heart. Though he is not aware of it the best way he can get veggies is by singing for his supper literally. He is on par with Alfafa from The Little Rascals. His good natured, easy going attitude should not be confused by others as a sign of being dumb or stupid. Like his pal Steven, he is genuinely loyal to those willing to be committed to the good fight. They have fun in whatever they do. Getting in and out of scrapes most of the time. They can afford to be silly and goofy because the world around them is so grim and serious. As Willy Wonka once observed: A little nonsense now and then is relished by the wisest men. Links to Beatles related sites are in the Links section.